It’s a new month once again, but this time there’s no new slice for Pizza by Certe. April’s Lafayette slice proved so popular they are keeping it for May! Which is good news for me since somehow April slipped by without a trip over to try the thing. 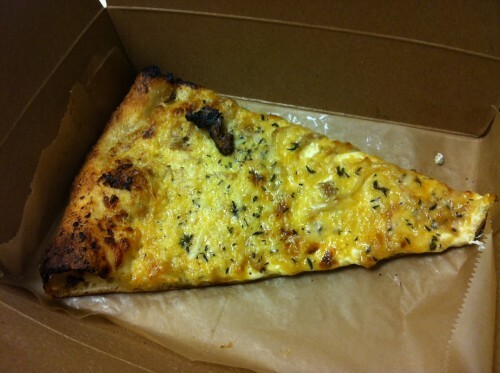 The slice consists of: Vidalia Onion Confit w/ Bourbon, Gruyere, Grana Padano, Fresh Mozzarella and Thyme. Yes, please! The cheese is definitely the dominant flavor in this slice. The different varieties create a creamy, melty layer of varying textures, while the onion provides some subtle flavor and crunch. You’ll definitely need something extra to make a complete lunch, and I went for the $7.95 slice plus side salad deal which allowed me to trick myself into believing that my pizza lunch was a “light” meal. The Lafayette is basically a jazzed up cheese slice and is worth a try for anyone looking for something simple and delicious. 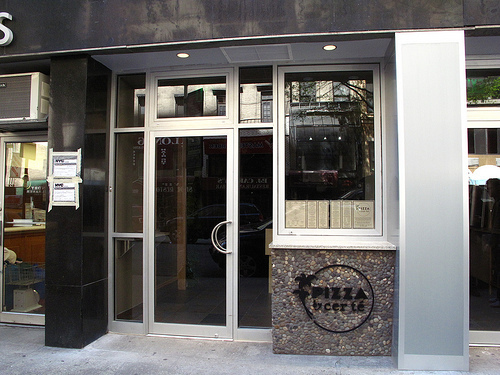 Posted by Anna at 8:45 am, May 2nd, 2012 under Pizza by Cer Te. I’m sorry, I love all things CerTe but the Brooklynite in me has to cry foul. 8 bucks for a slice? I don’t care what’s on it or how good it is, at that price it better clean my house and park my car. I stopped by today expecting to get pizza (Farmers and/or Buffalo Artichoke) but was tempted by something I’ve never seen before… CALZINI. Have they been making these and I just missed them? Its basically a cross between a giant raviolo and a calzone. I got the Meatball ($5.95) but they also had “Classic” ($4.50) and Kale with Quinoa ($4.95). Paired it with a fried spaghetti ball ($2.50) – very filling. Great flavor. Still under $10. woo hoo! At that price it should be called the bend over and grab your ankles slice. From what I read above, for $8 you get the slice and a side salad. The slice alone is probably less, right? I think the spices are normally $3.50 each… The monthly special might be a little more. Hi Everyone… Lafayette slice is $2.75. Add a side salad and total is $7.95. Glad you liked the Calzini’s… they are new! I tried this slice a couple weeks ago. I really enjoyed it. It’s a kicked up white slice. The onions add something to the slice. The slice is a decent size too. I got a variation of their meatball slice as well. Also tasty and enjoyable, though it was a square slice. I want to run back in there right now just thinking about the Lafayette. Hopefully it becomes a permanent menu addition, especially if they don’t have white slices.